On December 21, 2018, Colleen Duffy Kiko, Chairman of the Federal Labor Relations Authority (FLRA), sent a letter to the Union of Authority Employees (UAE), the union that purportedly represents FLRA employees. The letter informed the union that the law does not permit collective bargaining at the FLRA and that the contract between the FLRA and the UAE was not continuing after its December 21st expiration date. Today, the Center for Worker Freedom submitted comments supporting the Employee Benefits Security Administration's new proposed rule on the definition of "employer." CWF supports the new proposed rule because allowing more small businesses to join together to provide retirement benefits will help American workers. Today, the Center for Worker Freedom joined a coalition letter led by the Council for Citizens Against Government Waste. The letter was addressed to Republican Representatives urging them not to bring back earmarks. On November 8, 2018, the U.S. Department of Veterans Affairs announced through a press release by the Office of Public and Intergovernmental Affairs that it was ending official time for 430 medical professionals. On November 6, 2018, Americans voted for a divided government. The Democrats will now control the House of Representatives, while Republicans will retain control of the Senate. What do the election results mean for labor policy? Today, Grover Norquist, President of Americans for Tax Reform, released a letter in support of the House Oversight and Government Reform Committee’s amendment to the Modern Employment Reform, Improvement, and Transformation (MERIT) Act (H.R. 559). Congratulations to the Gerawan Farm Workers! On September 18, 2018, the California Agricultural Labor Relations Board (ALRB) finally counted the votes for an election that took place five years earlier. The Gerawan farm workers voted to decertify the United Farm Workers (UFW) by a 5 to 1 margin. The vote count was 1,098 for “No Union” and 197 for the union. Gerawan Farming has approximately 5,000 workers, and the UFW listed about 10,000 people as members in 2017. On September 17, 2018, Senator Elizabeth Warren (D) of Massachusetts released a letter to National Labor Relations Board (NLRB) Chairman John Ring urging NLRB member William Emanuel to recuse himself from a case. The Senator was joined by Senators Kirsten Gillibrand (NY-D), Corey Booker (NJ-D), Mazie Hirono (HI-D) and Tammy Baldwin (WI-D). 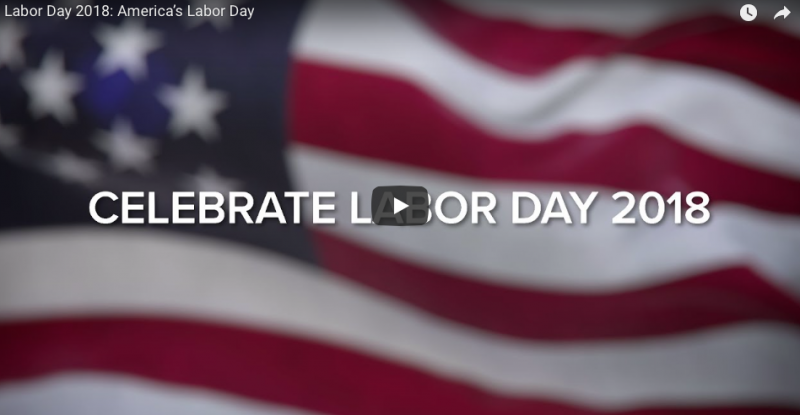 Earlier this week, the U.S. Department of Labor released several videos celebrating the American worker. The videos highlighted President Trump's Task Force on Apprenticeship Expansion, the increasing number of jobs available today, Association Health Plans, criminal justice reform, and DOL funding to solve the opioid crisis.